You may remember stringing up plastic or wooden alphabet beads as a child. Now that we are all grown up, here are stylish options that allow us to spell with style. Our satin ribbon bracelet and necklace design is simple and fun. Pewter alphabet beads, gold plated alphabet beads and sterling silver alphabet beads are classy and modern and allow you to create stylish and personalized pieces that will fit right into your jewelry collection. These satin ribbon baubles make perfect gifts, ribbons can be tied at any length, making these pieces one size fits all. 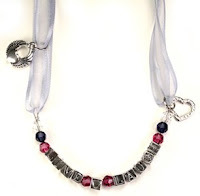 Materials: metal alphabet beads, colored accent beads such as crystal beads, Czech glass beads or metal beads, metal charms with large jump rings, flexible beading wire, crimp beads, crimp tool and ribbon. 1) Cut two pieces of satin ribbon. For bracelets, cut two pieces at 20 inches each, fold in half. For necklaces cut 30” each and cut in half. (Feel free to cut the ribbon to whatever length you desire or need. 3) Attach a bead stopper to one end of the flexible beading wire. String beads. Add crimp bead to each end. 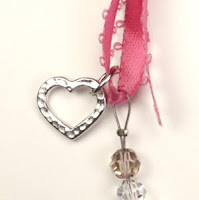 5) Attach charms on the ribbon. We used 8mm jump rings. This prevents from crinkling the ribbon. We opted to string our beads on flexible beading wire to allow for a wider selection of beads that can fit on the wire. Of course beads can be strung directly onto the ribbon, however, you will be limited to beads with larger holes. The use of a needle can aid in stringing ribbon through beads with smaller holes. Pull the ribbon through slowly to avoid snags, especially with organza ribbon. No clasp is required- just tie the ribbon in a bow around your neck or wrist. If you prefer to add a clasp, you can use ribbon cord ends to attach your clasp of choice.